I can tell you something about the "death" of the Elcaset system. It happened in late 1979 and 1980 when all (?) those machines were dumped into Finland. 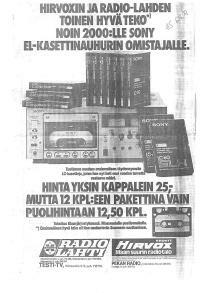 A Finnish company won the auction (by Sony international) and later sold those machines with 25 cassettes at a very low price: EL-5 + 25 cas. 795,- FIM and EL-7 + 25 cas. 1295,- FIM. 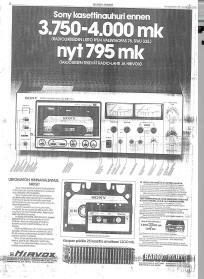 It was mentioned in the ad that plain cassettes would cost normally about 1200 FIM. I think that US$ was in those days about 4,50 FIM, nowadays it's about 6 FIM. And you can believe it was a real sell-out. They sold about 2000 decks in Finland. The company even guaranteed availability of cassettes and service for 10 years. 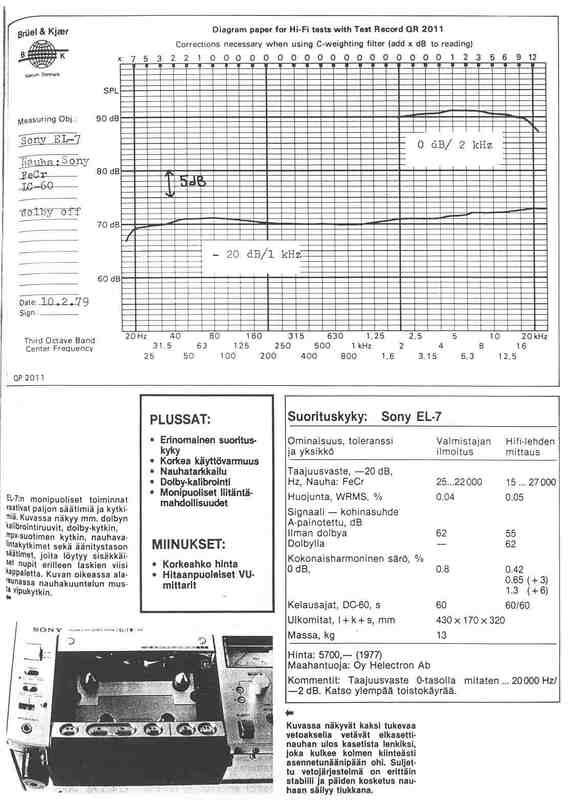 I don't know how many decks Sony manufactured, but I've been told that the major part of Sony's Elcaset decks were dumped in Finland. 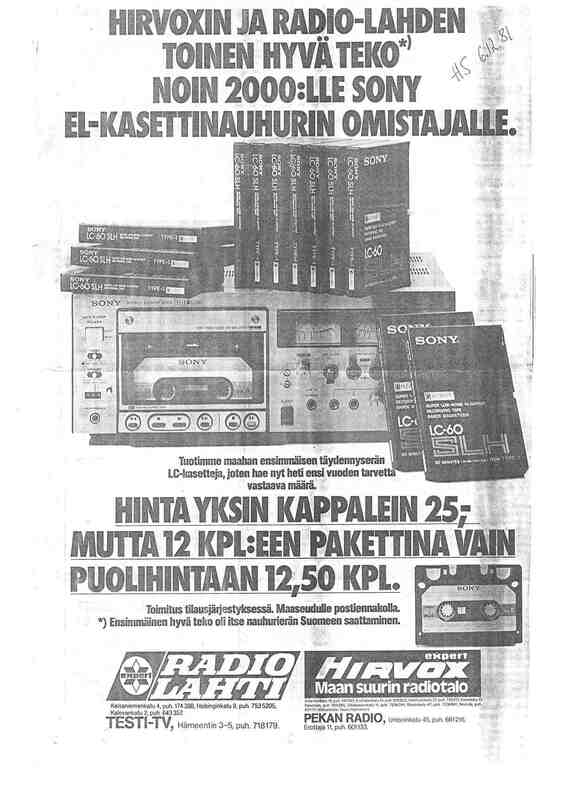 Two years later the offered cassettes 12,50 FIM if you buy a whole box (12 pieces). Quite a bargain!! 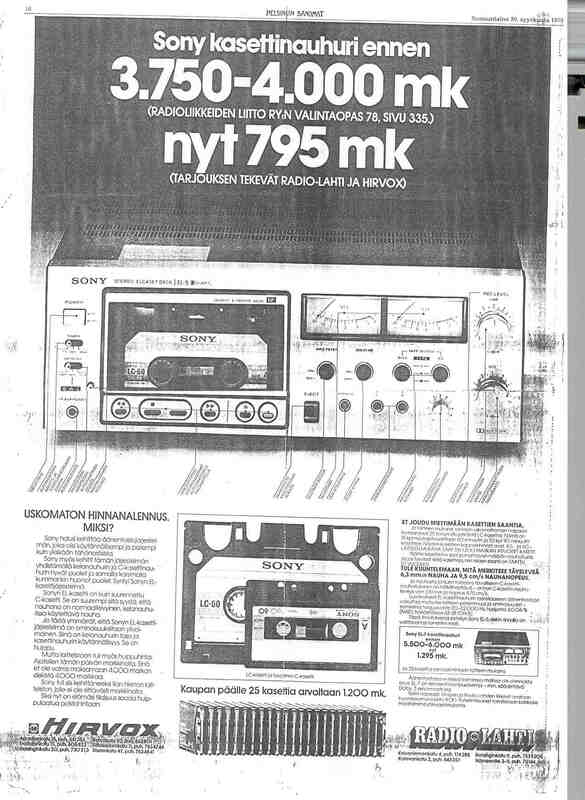 Here you can see the original pages of those newspaper ads (Helsingin Sanomat) from 1979 and 1981. I also scanned the brochure cover of EL-7. 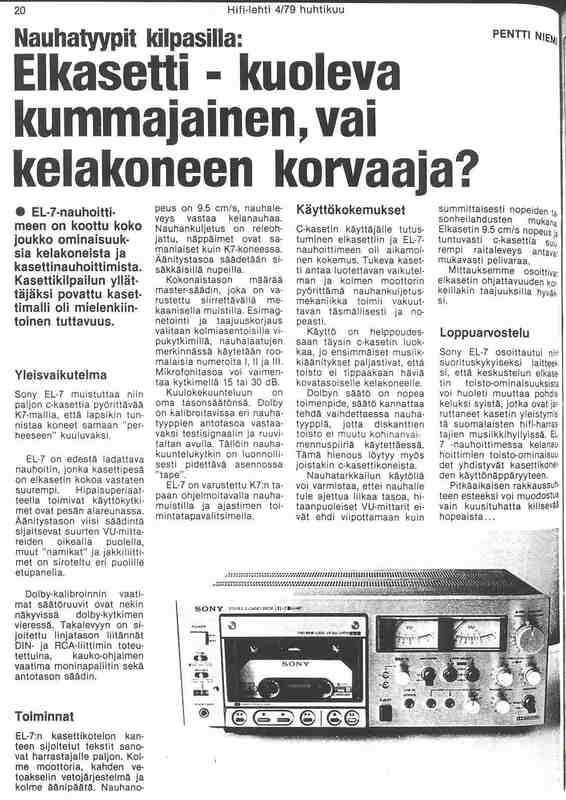 Of course they all are written in Finnish, but why not start to learn Finnish -;) The last picture shows the result of building fluorescent VU-meters (an article for DIY-hobbyists in HiFi-lehti in september 1981). 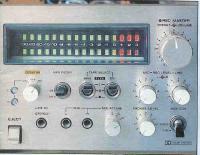 I have used my EL-7 now over 20 years and it still runs like a train - no problems. The only minor problem is that sometimes cassettes get stuck due to drying of lubrication, but I solved that with silicone liquid (same liquid as for car-door's rubber profiles). And about the sound quality: I need headphones to be able to hear the tape noise when monitoring the difference on source (CD) and tape. I've been very satisfied in my Elcaset system, which I have enlarged via buying old cassettes (about 2 $ piece and the old machine as bonus). 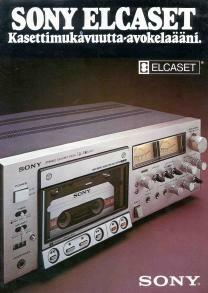 Nowadays recording to CD-R has come also familiar to me and use of Elcaset has decreased. 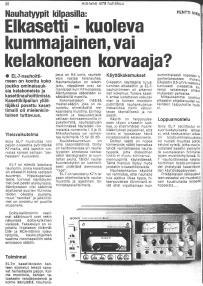 This is a Sony EL-7 test in the Finnish magazine Hifi-lehti from 4/79. 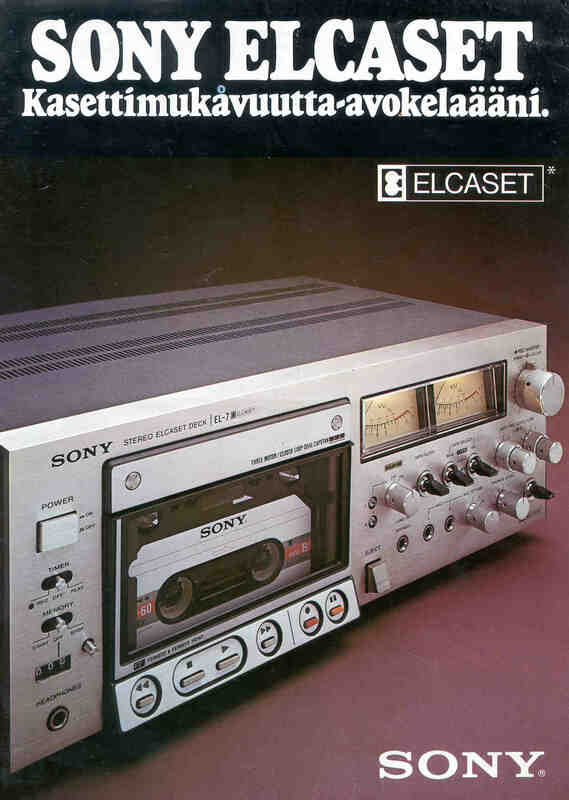 The article is titled "Tape format competition: Elcaset - dying oddity or replacing reel-to-reel". They find the positive things: excellent audio performance, high operational responsibility, tape monitoring, Dolby calibration and lots of connections. The very few negative things were high price and rather slow VU-meters. Maybe the price was too high (5700,- FIM, more than the average salary per month in those days). In the table they compare what Sony announced and what the test shows. 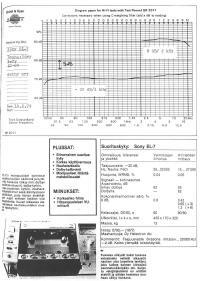 They measured Frequency response, Wow and flutter, S/N-ratio, Total Harmonic Distortion, Rewind time.... To me the frequency response curve is quite convincing compared to compact-cassette decks. Five months later the dumping of those decks happened at "a very reasonable price". And the rest is history.